Planning a wedding can be a time-consuming, stressful, and costly experience. Getting the right vendors can be one of the biggest challenges. Sure, you can find photographers, florists, and caterers online, but wouldn’t it be nicer to meet them in person, especially without having to drive back and forth across Chippewa Valley? The annual Winter Wedding Fair in downtown Eau Claire is here to help. The fair, now in its third year, will be 11am to 3pm Sunday, Feb. 17, in The Halls at the Lismore Hotel, 333 Gibson St. 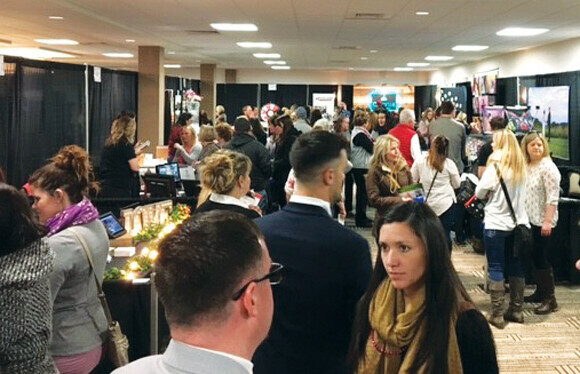 The fair will feature two floors filled with dozens of wedding vendors, giving future brides and grooms – as well as their families and members of their wedding parties – a chance to meet and learn about photographers, dress retailers, venues, limousine services, bakers, caterers, and more. Good relationships are critical, especially in light of horror stories that Gill has heard about vendors hired online who fail to show up on the big day. In addition to meeting nearly 80 wedding service providers, visitors are invited to grab a “bride’s bag” at the door as well as a cocktail at the bar. There will be tours of the Lismore’s rooms and suites, bridal fashion shows, live music on both levels, limousines on site, and thousands of dollars worth of prizes – including a honeymoon package from Higgins Travel. And while fairs like this tend to draw a largely female crowd, Gill notes that grooms-to-be can get in free, which gives incentive for couples to attend together and make joint decisions about wedding vendors.